This 16 days Uganda safari take you to best tourist destinations in Uganda and the tour will start from Murchison falls national park which is the largest national park in Uganda. 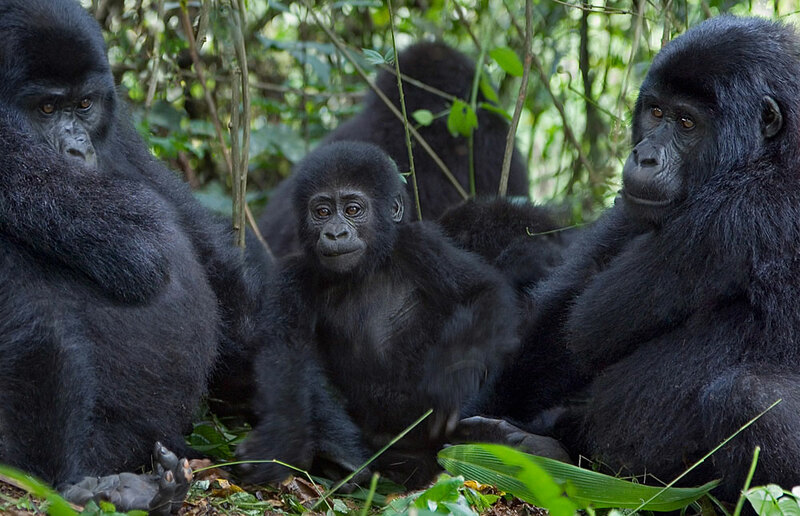 You will enjoy this 16 days tour by visiting the top of the falls, visiting the endangered mountain gorillas, a lot of wildlife and birds to be sight. Jewel safari driver will welcome you from Entebbe international airport and transfer you to Kampala at the hotel where you will spend night and have dinner. Waiting for next day to be transfer to Murchison falls national park. Take tea very early in the morning and then jewel safari driver will meet you and brief you about your 16 days trip in Uganda. The journey will then kick off after the briefing, you will have first stopover at Luwero to trek Ziwa Rhino in the sanctuary. Proceed to Masindi town where you will have lunch at Masindi Hotel and after lunch continue to Murchison falls. On arrival to Murchison you will visit the top of the falls to see how water forms rain bows and see water hitting the rocks and forcing themselves out of the rocks. After head to lodge for checking-in, dinner and overnight at paraa safari lodge. Have delicious cup of Africa cup very early in the morning. Head for morning game drive in the savannah vegetation of Murchison falls where you will have opportunity to see herds of elephants, lions, leopards, giraffes, buffaloes, hippos list the few. After game drive head to the lodge for lunch and some rest. In the evening embark for launch cruise where you will spot a lot of animals on the river bank drinking water and other cooling themselves from hot African sunshine in the water of river Nile. You will trek the top of the falls and later return to the lodge for dinner and overnight at Paraa safari lodge. Wake up early and take breakfast. Pack your luggage for transfer to kibale national park where you will trek chimpanzees. The driver will drive along Lake Albert, to the escarpment area for view of the Great Rift Valley and viewing beautiful rolling landscape, ever green vegetation and local plantation. Proceed to Hoima town where you will have lunch at Glory Summit Hotel. After lunch continue with the journey to kibale viewing many activities being done by the local people and tea plantation, you will reach later in the evening and check-in at lodge for dinner and overnight at kibale forest camp. Wake early and have tea before setting off for chimpanzees trekking. At 7:30 your should be at park’s headquarters for briefing on the rules and regulations of chimpanzees trekking but the rules are just the same as for gorilla trekking. Before leaving the lodge, make sure you carry trekking equipments, packed lunch and enough drinking water. The well armed game ranger will lead you into the jungle to search for chimpanzees, sometimes it is easy to find them and sometimes hard so it will take time till you find the chimpanzee family. You will be allowed one hour with them to take photos, see their behaviors and learning more about them. Return to the lodge for lunch and relax for while be for heading for an evening community walk. You will visit nearby community see their activities, traditional dances and music. Return to the lodge for dinner and overnight at kibale forest camp. Wake up with African cup of coffee and get ready to be transfer to semuliki national park. You will leave early so as to reach at lunch time. Have lunch at Semuliki safari lodge and rest for two hours. In the evening go for evening game drive and visiting the hot springs. Return to lodge for dinner and overnight at Semuliki safari lodge. Morning breakfast will be served to you and the driver wills than transfer you to Queen Elizabeth national park, you will have view of Rwenzori Mountain and lush vegetation. Proceed via Kasese town and reaching the park early so as to catch up with time for lunch. Lunch will be at Mweya safari lodge and after lunch relax bit. In the evening go for boat ride on the Kazinga channel with high opportunity of viewing plenty of bird species and animals that include hippos, crocodiles, and leopards to list the few. Return to the lodge for dinner and overnight at Mweya safari lodge. Take tea early in the morning and get ready for morning game driver a round queen Elizabeth national park. You will have chance of spotting a lot of animals, birds and savannah vegetation. Some of the animals include Uganda kobs, buffaloes, and herds of elephants, leopards, warthogs and giant forest hogs to list the few. Go back to the lodge for lunch and waiting an evening game driver to the southern part of queen Elizabeth in Ishasah region where you will see tree climbing lions and others animals. Return to the lodge for dinner and overnight Mweya safari lodge. Morning breakfast, then proceed to lake katwe tourism center where you will view traditional salt mining experience and take visit to lake Munyanyanga to spot flamingos. Continue to Bwindi passing Ishasha plain with high chances of spotting tree climbing lions. Make stopover at savannah Resort Hotel where you will have lunch and then proceed to Bwindi. Check-in at the lodge for dinner and overnight at chameleon hill lodge. Take African cup of coffee and head to the park’s headquarters for briefing and then set off to the jungle to search for the endangered mountain gorillas. After allocating the gorilla you will be given one hour with them. Return to the lodge. After morning breakfast drive by lake bunyonyi and explore the lake and embark on the journey to lake mburo and on arrival start off with game drive in the trials of the park spotting wildlife like the elephants, zebras, Topis, impala and elands to list the few. Check-in at the lodge and have lunch at Mihingo lodge. After lunch go for boat ride at Lake Mburo where view animals at the lake shores drinking water like crocodiles, hippos, elephants and impala to list the few. Return to the lodge for dinner and overnight at Mihingo lodge. Take morning breakfast very early in the morning and get into the road heading to Kampala. You will view beautiful traditional homesteads, banana plantations, farms and local people doing their daily activities. You will an en-route stop for lunch and then continue to Kampala at the hotel for dinner and overnight at Serena hotel. At 6:30 take morning breakfast and set off for jinja to avoid jam of jinja road, you have to leave Kampala early. You will have first stopover at the sezibwa falls and have brief history of the falls and continue to Mabira forest for nature walks and birding experience. Proceed to jinja while seeing the sugar cane plantation, tea plantation, maize farms and banana plantation. Arrivals to jinj go for lunch at the source of the Nile café and later visit Bujagali falls and can have boat ride. Visit jinja town for city tour and after return to the lodge to dinner and overnight at source of the Nile café. After breakfast driver to take you to source of the Nile to explore where the Nile starts from, proceed to Mbale town for sipi falls. You will have lunch from Lacam lodge. Later in the evening go for community walks in the nearby communities. Return to the lodge for dinner at Lacam lodge, sipi falls. Take breakfast and go for guided nature walks to the 3 waterfalls in sipi. You will see water flowing to the bottom hiking the rocks; you pass by local farms of banana plantation, coffee plantation, maize and others crops. Return to lodge for lunch and after lunch head to Mount Elgon for hiking. Dinner and overnight at the lodge. Take coffee and have morning city tour for Mbale town. Proceed with the journey to Kampala having lunch at jinja. On arrival to Kampala, the drive will drop you to the hotel or to Entebbe international airport to get your flight back home. End of the 16 days safari.